Mark Chitwood Photography: Pretty In Pink? It just so happened that while we were in Playa Del Carmen there was a PGA event. 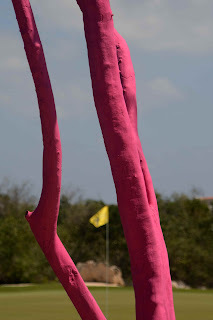 The Mayakoba Golf Classic. How cool is that. So my friend Ted and I went to the pro-am. This is typically held on Wed. before the actual tournament is played. There are professional golfers teamed up with 4 players. It is a chance to see some golfers up close - and take your camera. I spotted this pink tree. Not sure what that was all about. But I had to make a click. So I framed up the flag and that was about it. If anyone can find out why they had a pink tree - that would be cool.